Capcom Mobile is frowning over the controversy surrounding MaXplosion's similarity to Twisted Pixel's 'Splosion Man, but doesn't admit to theft. Capcom Mobile released a smartphone title called MaXplosion in early January, which to Twisted Pixel looked like a blatant ripoff of its Xbox Live Arcade title 'Splosion Man. Capcom Mobile issued a statement in response, saying it was "saddened" by the situation. The nail in the coffin appeared to be the reveal that Twisted Pixel previously pitched 'Splosion Man to Capcom, which rejected the game. According to Capcom Mobile, it had no knowledge of that pitch, as its offices are totally separate. 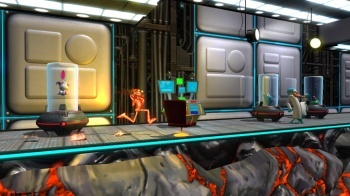 Capcom Mobile's statement reads: "While Twisted Pixel did have discussions with our console game team about publishing 'Splosion Man on game consoles, Capcom Mobile is a different division of Capcom with separate offices and as such, had no prior knowledge of any meetings between the console game team and Twisted Pixel." It goes on to say that MaXplosion was developed "independently" by the offices of Capcom Mobile. The statement doesn't offer any kind of explanation for the similarity between MaXplosion and 'Splosion Man, but I have a feeling the lead designer probably got a stern interrogation about his/her inspiration. Capcom Mobile only said it's "saddened by this situation," and hopes to rebuild the trust of the gaming community somehow. MaXplosion is still available for purchase, with no indication that Capcom Mobile plans to halt sales. The truth behind the design of MaXplosion, and whether it truly was "complete theft" as Twisted Pixel says, will likely never be known.